3 For The Price of One: If we’re already at your house, we might as well make it worth your time. Within the same service call, we’ll diagnose your original appliance and up to 2 additional appliances FREE of charge. 50% Off For 30 Days: As our way of saying thanks, with your paid repair or service call, you’ll get 50% OFF any future service calls, for up to 30 days. Free Reschedule For Up To 90 Days: It rarely happens, but if the problem doesn’t present itself during our first visit, have no fear! We will return at no additional charge to recheck it for up to 90 days. Give us a call and we’ll reschedule your appointment. Required Warranty Deposits: Especially with warranty claims, manufacturer policies require, we cannot stop or cancel an order once it’s been placed. As such, we require a deposit equal to 50% of the repair cost. Discounts and Coupons: In addition to our online monthly specials, Seniors, Active Military, Police and Firefighters get a 10% discount toward all repairs. Discounts and coupons are valid during normal working hours and must be presented during time of diagnosis. Coupons cannot be combined with other offers and do not apply toward service call charges. Our $25 coupon is only eligible with paid repairs over $100. When Warranty Is Void: In the event you ask us to install a part that is not supplied by Action Appliance Repair; we cannot, under any circumstance, warranty or guarantee the repair. This includes additional parts or house trips needed to complete the repair. Our Normal Rates: The rate we deliver clients depends on a handful of different factors. Our current rates reflect the various costs involved in each repair and the marginal profits which often do not exceed 10% over the cost of doing business. We maintain high standards and ensure that our company continues to be fair and competitive in the marketplace. As a further example of how we operate, our companywide profit stood at just 5% last year. Our goal has always been to provide superior customer care and service at a reasonable price. 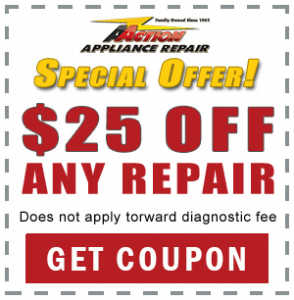 To give our customers the very best in appliance repair we offer military, senior, civil servant, and a variety of other monthly discounts and coupons. Contact us today to learn more about these programs and reductions. Along with these discounts we will also match any similar local discounts from our competitors. If you require 24/7 Emergency Service, you will be billed at a higher rate. Please call our office for more details.